I’m missing home right now. I never thought I would miss that hot, dry, windy city we are from but today I do and it’s not the wind or the dry heat. It’s our friends and family. Saturdays spent with friends eating artisan cheese with roasted radishes as your overly hyper dogs run circles around your feet. It’s the comfort of lazy Sunday dinners and a mountain of dishes to do. It’s drinking too much wine and thinking you are the lead singer from Silversun Pickups during a fierce Rock Band session. What I especially miss is the social aspect of being around food and people that I love. San Diego is a Mecca for fresh food and heirloom fruits and vegetables. Some of the best sea urchin in the world comes from here. The soil is not solid rock and you can pretty much grow anything you want with the climate – year-round. I can drive five minutes to get blueberry balsamic vinegar and five minutes more to get a dozen fresh eggs. How could you not love this place? And I do but one might think that after six months in this paradise I would have enough new recipes to write my own cookbook, but the sad truth is that I don’t cook like I used to and I have been racking my brain for months to figure out why and I think I’ve finally have an answer. What fun is cooking if you aren’t entertaining too? I can spend hours and days planning menus for parties. I love scouring the Farmer’s Market and building dishes based on what’s in season and often something new that I’ve never seen before. I love putting my chinois, immersion blender and truffle oil to work and learning how to flex my culinary muscles so that at the end of a meal when bellies are full and the conversation is flowing I can sit back, take a deep breath and feel happy. Cooking equals happiness to me. This is a wake-up call. Chassie, it’s time to get out of your comfort zone, meet some friends and cook. Instead of missing home I’m going to bring home to San Diego with a recipe for roasted radishes. My good friend Amy treated us to a bowl of tiny radishes that had been roasted to until the spicy bite was replaced with a subtle sweetness and then tossed with chives. She served them with leftover duck, a selection of gourmet cheese, homemade bread and jam. We sat around their kitchen island at 10 in the morning and savored every bite. I had a bunch of Easter Egg Radishes and some parsley from the garden so I set to work browning them in a pan with brown butter. They were good but not nearly as good as Amy’s so I’m going to share her recipe with you instead. 1. Heat your over to 450º. 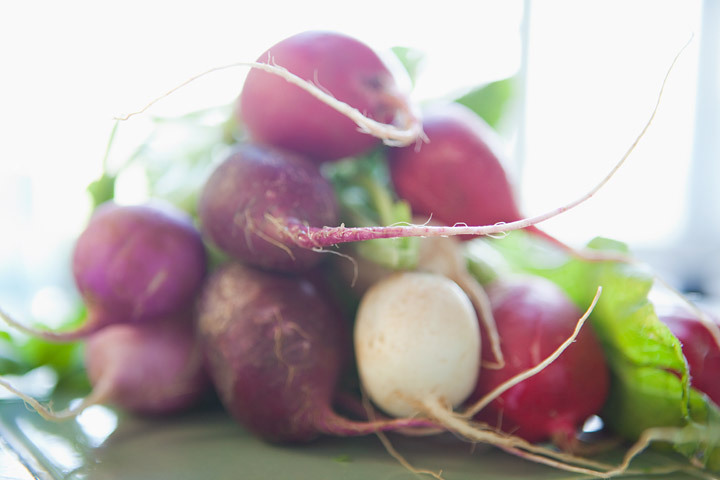 Slice the radishes in half and toss with olive oil and salt. Lay them face down on a baking sheet and roast for 15-18 minutes. 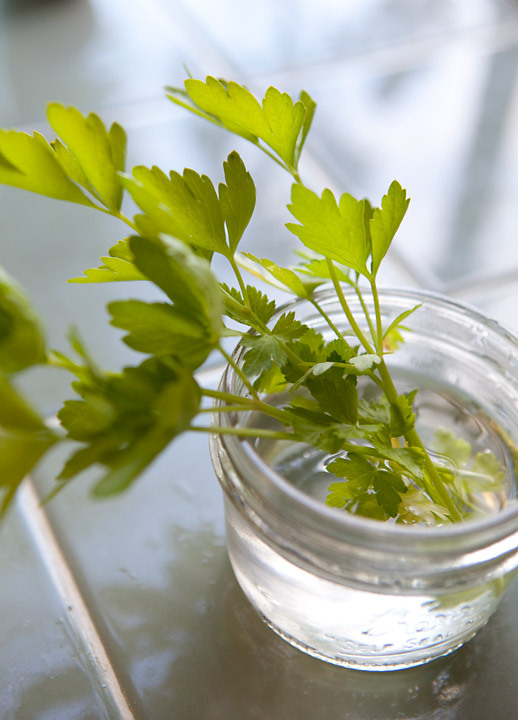 Remove from over and toss them in a bowl with chopped chives. These can be served hot, cold or room temperature. This post made me sad. I can’t wait to see your journey of finding a new group of friends to entertain. This recipe is perfect because I need simple.. Hope the cooking starts back up. Miss ya! thanks amber! i miss you too! want to come to san diego so I can cook for you? I have confidence that you’ll be cooking up a storm with new friends in no time. I love radishes, but I’ve never tried cooking them before. Can’t wait to try this recipe. Take care…we miss you in LV. awwwh, chass! next time we’ll pack up the psycho dogs and come visit you so you can bestow upon us all that SD has to offer. we’ll bring the picnic basket and make the meal mobile! we miss you already. 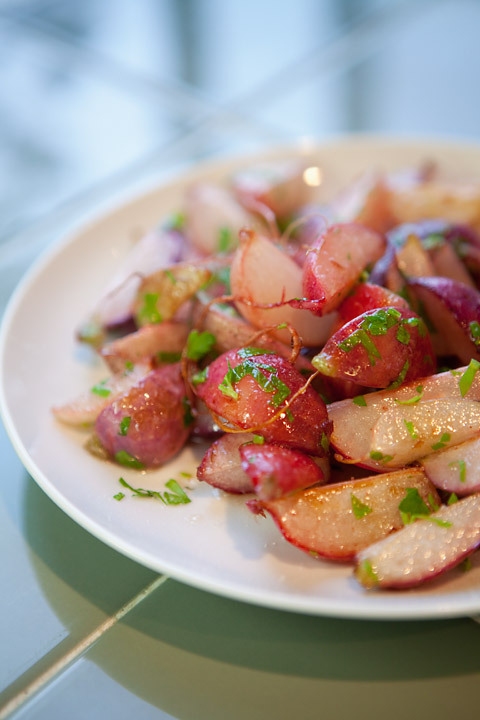 toss some lemon zest with those rosy little radishes and they’re even more heavenly!